...to remind you that the current administration will, in fact, be in power for several more months. Not to count chickens, but I don't see a strategic scenario in which John McCain pulls off a win on Tuesday, which means that we have two vital tasks to accomplish as quickly as possible. The first is the battle for Obama's soul, as JJ put it. The second, which is not entirely unrelated, is a full-fledged understanding of the damage that the Bush administration did to the country and to the world. It would be far easier to follow in Bush's footsteps, to keep using the tools they forged, than to truly take the country in a new direction. Indeed, to abandon everything that they accomplished would be literally impossible: in the absence of something like 9/11 or Pearl Harbor, the United States is just not nimble enough to radically change its foreign policy over a single presidential term. To have a chance of salvaging the rule of international law, then, we need to know how they did what they did as soon as humanly possible. By January 20th, at the latest. There's a really key moment that I found in trying to understand all of this, which is the moment of the president's Mission Accomplished speech. The famous May 1 speech. He appears on the aircraft carrier... He gives the thumbs up, and grinning, a pose that soldiers at Abu Ghraib were mocked for using. 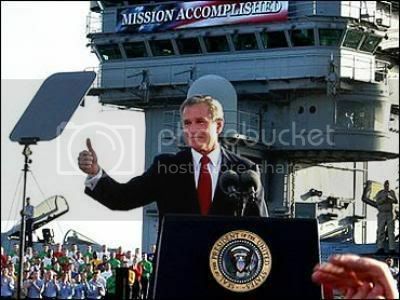 And he says, "Mission Accomplished"... he says "This is the end of major combat in Iraq." Well, as we know, it was the beginning of the war, almost. But what does he mean? On that same day, in Afghansistan, Rumsfeld made the same declaration. What does this mean? This is now a terrorist, an anti-terrorist campaign, it's an anti-insurgent campaign. And they took a tiny little loophole in the Geneva Conventions which said that in the name of imperative military necessity an occupier may seize people temporarily. And they used it to justify mass detention, without charges, in secret holding facilities, without any system of release. And that created the climate, and set the stage, for which our soldiers, the M.P.s, found themselves becoming the poster boys for this policy. It was no longer the Iraq War, it was the global war on terror in their minds. And anything was justified. And the soldiers were told this. The "Mission Accomplished" declaration was, in other words, about making a real war into the shadowy, vague, lawless war on terror. It was a stupid political stunt, but it was also the coldest of legal moves, and set the stage for everything that happened in Iraq in the next five years. By its very nature, Obama's presidency will be a breath of fresh air that this country cannot live without. He promises a sharp distinction between his administration and that of the current president: "What's more, in the dark halls of Abu Ghraib and the detention cells of Guantanamo, we have compromised our most precious values. What could have been a call to a generation has become an excuse for unchecked presidential power." But I can't help but worry about statements like "The terrorists are at war with us." Obama believes in the War on Terror – and the question is, which war? How much better will Obama fare, when faced with similar challenges? The legacy of the Bush Administration remains in place until we actively dismantle it, remember. Merely leaving Iraq is not enough, if the chance of war elsewhere remains high. Increasing non-military aid is meaningless if we continue to hold prisoners in endless captivity. The "war" is over in Afghanistan too. To morally continue the worldwide fight against terror, we need precise and humane legal oversight. We need a Fifth Geneva Convention, a code for the 21st Century, for insurgents, terrorists and violent criminal conspiracies. One of the first true tests for the soul of the Obama administration will be its approach to this issue: the extent to which it pursues a legal, moral justification for the war on terror. To take significant military action without such justification is to be just as bad as Bush, no matter who gives the orders or what they say about it. As Gourevitch puts it, we do not want the standard with which we "measure ourselves in the war on terror [to be] that we're not quite as bad as the terrorists. That's too low a standard." We are better than that. We have to be, or the surge of genuine patriotism we've all felt over the last few months is no better than the flag-waving of the last eight years. As sad as it is, we have to prove our country's morality. And I fear it will be far harder than it sounds. now would be the perfect time for me to insert a link to the paper I wrote this past summer on creating a new court system to try suspected terrorists/"illegal enemy combatants"... if only the organization who is publishing the paper would get their act together and put it up on the website. damn them. Yeah! God damnit. That would be great.